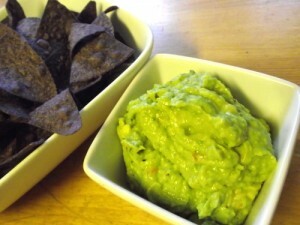 Guacamole is one of those condiments that I use on almost everything. Thick and rich and creamy, it isn’t just for dipping chips into in my house, in fact, I love guacamole on sandwiches instead of mayo! This is a very easy recipe and lends itself well to your own personalization so add bacon or basil or whatever your heart desires. Whip this up in just minutes and start enjoying! The addition of the lemon juice not only adds a delicious flavor, it also keeps the avocado from turning brown. Peel the avocado and then throw it all in the food processor, blend until smooth and viola! You’re done! If you don’t have a food processor then cut your onion & pepper as small as possible and mash the avocado with a fork.